Billionaire Tilman Fertitta walks into the room. You can’t believe this heavyweight, the CEO and sole owner of multiple restaurant franchises, has given you the time of day. Tilman sits down, settles himself, and glances at the clock. “Well friend,” he says, “I have about three or four minutes before I have to get out of here. What do you wanna know?”. As the head of sales at your small company, you’ve prepared for this moment. Tilman pauses for a second. He gets up and walks out, as you sit there digesting this quote. Exclusive Bonus Content: Not sure which sales graph to use? Download our guide with 5 sales use-cases with a graph illustrating each! OK, so that little vignette was made up – mostly. The question and answer we included comes from an actual interview that Fortune magazine did with billionaire Tilman Fertitta. We used this little story to draw you in and illustrate how even the highest echelons of business are focused on knowing your numbers. That’s why, in this post, we’re going to go over 10 sales graphs and charts that will fuel your imagination and give you some useful resources. These charts and graphs each illustrate crucial aspects of your sales department that you would be well served to know in depth and keep track of. And rather than using Excel or Google Sheets to do so, you can focus on these charts instead. 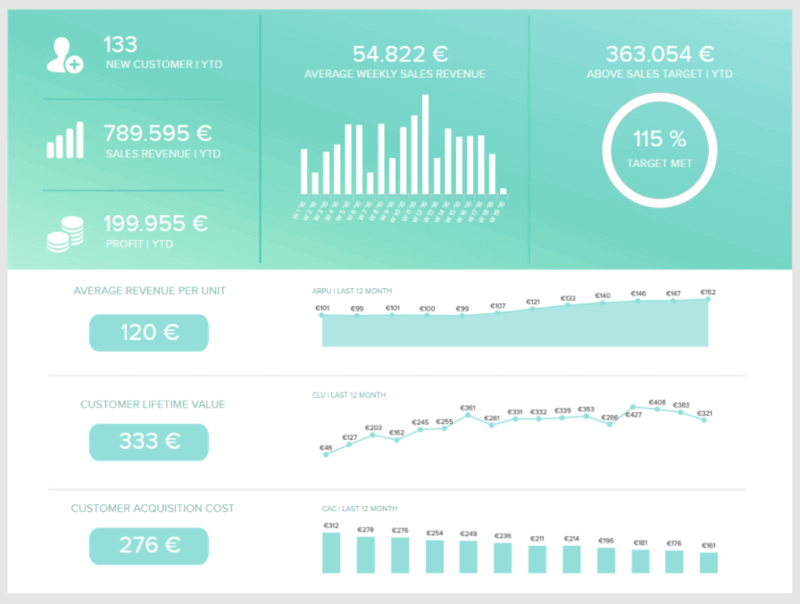 Because after all – a dashboard is worth a thousand Excel sheets. If you’re looking for a broad overview of your sales performance, this graph should do just the trick. It tells you how many new customers you’ve gotten this year, how much revenue each one of those customers is driving, and how much each of those customers costs to acquire – along with many other useful sales KPIs. Note the mix of charts that show trends over time and standard numbers. This gives to that sales graph an overall sense of visual contrast which makes it much more digestible at a glance. However, keep in mind that the sales graphs available on datapine are very customizable – so if certain KPIs on this template are too broad for your liking, you can make them more granular at will. Let’s examine how you can do so with the following sales KPIs. Setting goals and then keeping track of whether those goals are being met is a hallmark of high-performing teams. After all, if you have no idea what you’re aiming for, it’s pretty hard to achieve it. This granular graph shows you several KPIs related to sales revenue, including the number of new customers you’ve signed up so far, your total revenue to date this year, and how your month by month projections have tracked with your actual revenue. It can be really useful to see if certain months are higher in sales revenue than others, so that you can plan on those trends in the future and not be surprised by having some very low months and other peak months of revenue. 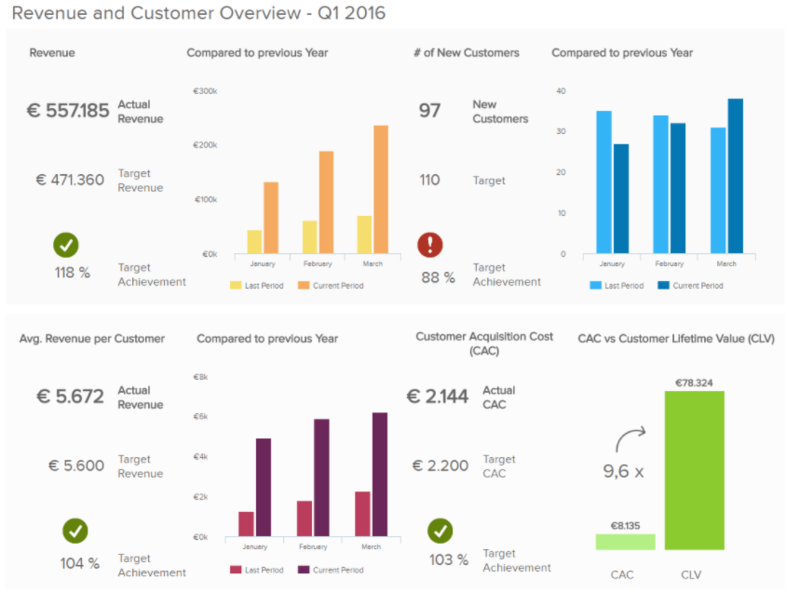 Your Customer Acquisition Costs (CAC) is one of the most important KPIs you can keep track of. If all you kept track of was Customer Lifetime Value and Customer Acquisition Cost, you could see a lot of important data about your business. Fundamentally, it’s ideal to have your CAC as low as possible. However, if you have a higher CLV than your competitors, you can beat them by being able to afford a higher CAC. For example, let’s say you have a website selling digital products of varying prices. If you can set up your email marketing and your marketing funnel to boost your CLV, then you can spend more on Google or Facebook Ads to get customers than your competitors can. In the long run, that’s a pretty powerful competitive advantage. All of this to say: CAC is important, but it should be viewed in relation to other KPIs and you don’t necessarily need to make it as low as possible. With that being said, this sales chart template will allow you to see the trends in your CAC over time. If you haven’t been strategically embracing a higher CAC, this graph can serve as an “early warning system” for a rising trend. This sales graph is incredibly useful, as it shows you how your costs of acquiring new customers are comparing to the revenue you’re earning from each customer. To calculate ARPU, you just divided your total monthly revenue by the total amount of customers you have that month. Again, this graph can serve as a warning system to make sure that you’re staying profitable in the short term. CLV is great and all, but cash flow is king when it comes to keeping the lights on. This sales graph tracks how long it takes accounts to get through your sales funnel on average, all the way from identifying an opportunity to closing an account. All else being equal, a shorter sales cycle is better, and so this graph’s ability to compare your different sales managers/representatives closing rates can show you who your top performers are. Just make sure to see the size of the deals your managers are closing, and keep track of the CLV of those customers. Because all other things are rarely equal – you may find that one sales manager takes a long time to close deals, but regularly signs large packages with customers that stay on for a while. Telling that manager to shorten their sales cycle could backfire. Increasing revenue in a sales based business can come from several areas, broadly speaking. You can increase the number of leads you target, increase the size of the deals you close, increase customer retention rates, or increase the conversion/closing rates of the leads you currently have. This sales graph enables you to understand how effectively your team is converting leads to opportunities and opportunities to closed deals, both on an overall basis and for each sales manager. It also lets you see how many leads you are contacting, and gives you a granular step by step breakdown of how many people make it to each stage of your sales funnel. This lets you see what areas you should focus on. Yes, no sales team is perfect, and you can always get better at any of these areas, but this graph will help you to identify the “low hanging fruit” where you can invest a little bit of effort to get a large ROI. If you’re on a committed, aggressive mission to push your sales numbers higher and higher each quarter, this graph will be your best friend. Not only does it show your sales revenue compared to previous periods, but it breaks things down by representative/manager as well, letting you know the rockstars on your team. This is a really fun interactive sales graph, as it lets you see your revenue and sales according to different time periods that you select. In particular, the monthly view is extremely helpful. While it’s kind of neat to be able to look at sales revenue according to the day and the week, these views don’t really lead to any sort of actionable information. However, being able to see that May is your best month for sales can lead to actions like doing a new marketing campaign in April to boost sales even further. 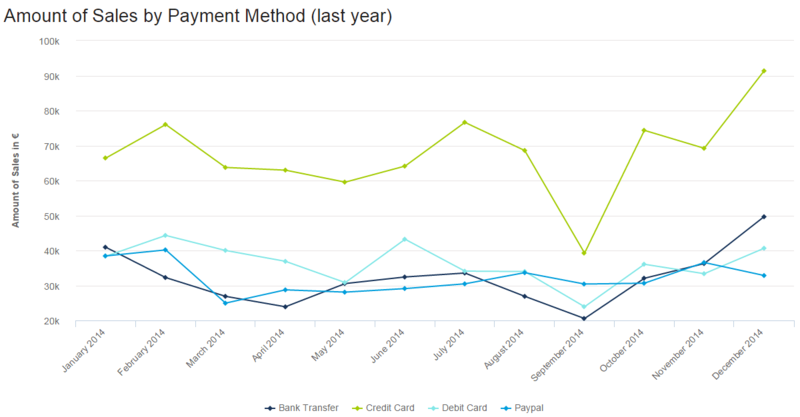 This line graph lets you see how your different payment methods tracked over the previous year, both compared to each other and on an objective basis. This sales graph would be great if you just rolled out a new payment option like Paypal, or if you used Square at a booth to take payments and you wanted to see how much revenue was being brought in through these options. You can also quickly and easily see overall revenue trends by month. For example, in this graph, overall sales dipped quite a bit in September before climbing up to normal and then higher than normal levels in October and December. 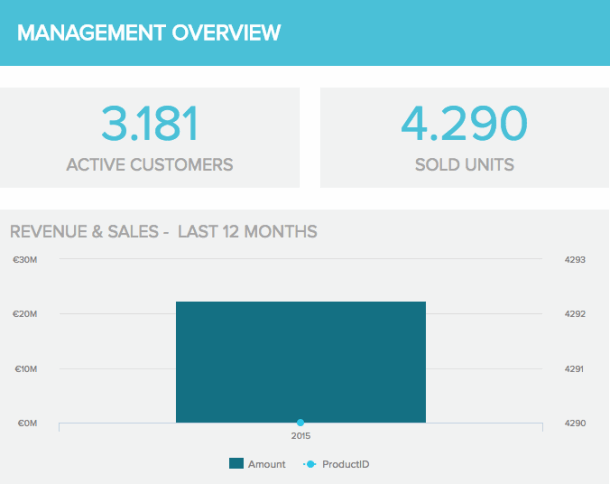 Finishing with another “overview” style sales dashboard, this quarterly revenue and customer overview shows a ton of your most important KPIs in one, easy to understand format. Using a quarterly view is a great practical option for making data-driven decisions, as a month is often too short of an amount of time to see real changes, and a year is a bit too long to make course corrections. Knowledge is power, and this is especially true when it comes to sales. These 10 sales graphs offer you insights all the way from a broad overview to a very granular focus. These different perspectives allow you to access all of the data you need to guide your company with business intelligence in the right direction and make sure you’re hitting your goals. Additionally, some of these graphs can serve as effective early warning signals so that you can see potential issues with your cash flow before they become real problems. 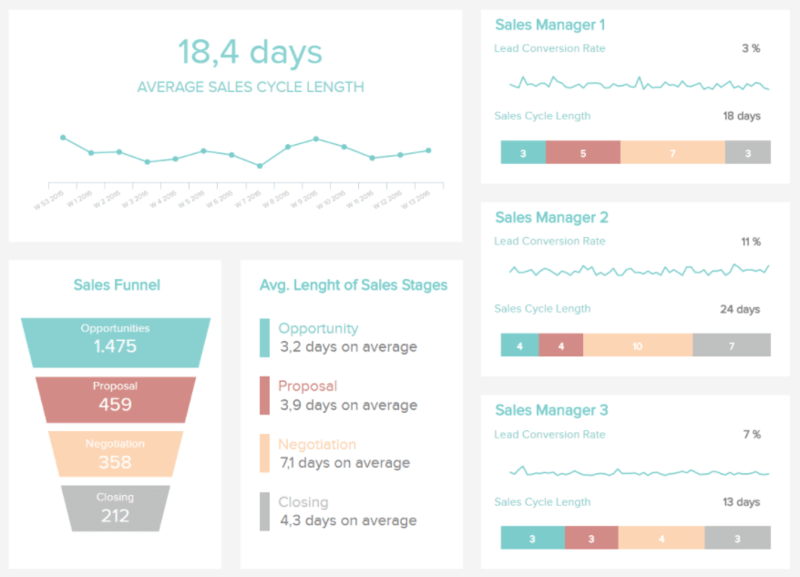 Use these sales graphs and charts as inspiration for your own sales dashboards so that you can have at a glance actionable insights available to you at all times. 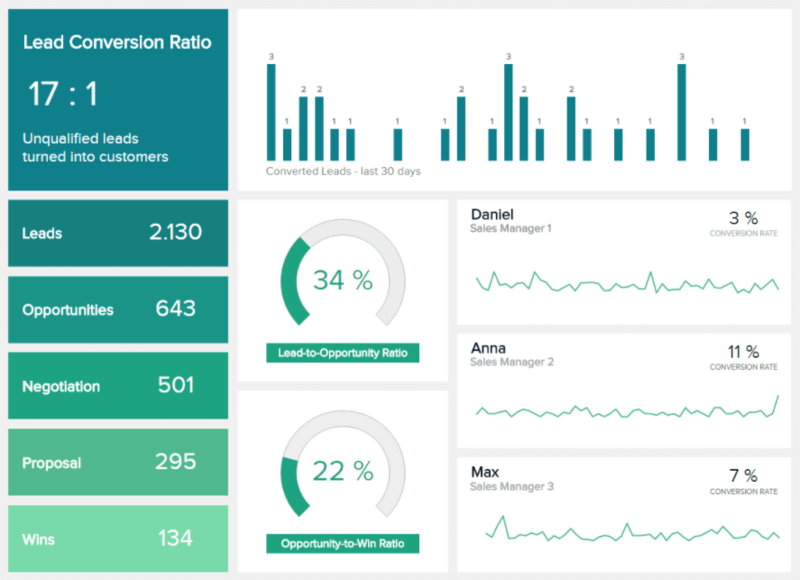 If you wonder how you can create effective sales graphs and charts, start datapine’s free trial and empower your teams with compelling dashboards!